Home » Collection » From roof of Brahmin's house wherein we'd rented Third floor room six months December to May 1963, could see past temple mandir tops across Ganges river to other shore. Our balconies hung over vegetable-meat market one side, other side overlooked sacred street down to Dasasumedh [or Dasaswamedh?] 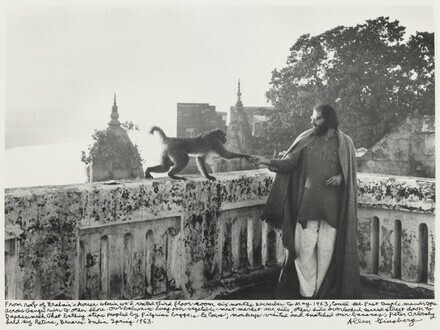 Ghat bathing steps peopled by Pilgrims beggars & cows; monkeys visited and snatched our bananas, Peter Orlovsky held my Retina, Benares India Spring 1963. From roof of Brahmin's house wherein we'd rented Third floor room six months December to May 1963, could see past temple mandir tops across Ganges river to other shore. Our balconies hung over vegetable-meat market one side, other side overlooked sacred street down to Dasasumedh [or Dasaswamedh?] Ghat bathing steps peopled by Pilgrims beggars & cows; monkeys visited and snatched our bananas, Peter Orlovsky held my Retina, Benares India Spring 1963. Signed by artist, lower right on sheet in black ink: Allen Ginsberg; artist inscription, across bottom under image: From roof of Brahmin's house wherein we'd rented Third floor room six months December to May 1963, could see past temple mandir tops across Ganges river to other shore. Our balconies hung over vegetable-meat market one side, other side overlooked sacred street down to Dasasumedh [or Dasaswamedh?] Ghat bathing steps peopled by Pilgrims beggars & cows; monkeys visited and snatched our bananas, Peter Orlovsky held my Retina, Benares India Spring 1963.; on verso, by unknown hand, across lower center in graphite: GD-AG-89; across lower right: GDC-887; in lower left corner: C: A61-17; across lower left: 62/#58/1089; across upper left corner: #24 VE; across upper right: Signed 10/23/89 10/18/89 S.K. Allen Ginsberg Estate; Ellen and Gary Davis, Greenwich, CT (through Howard Greenberg Gallery, New York); gift to NGA, 2008.